The R Street Corridor technically includes Q and S Street, where there has been some traction gained with Fremont Mews, Capitol Park Homes, 1500 Q Street, and a couple other small projects. The Foundry Building which holds the Fox and Goose, Art Foundry, and the cool knitting shop my wife likes was one of the first to get a face lift. More recently the R Street Market and the renovation of the Perfection Bakery at 15th and R into the Icon, Empire, and La Raza Art Gallery. In all, not too much progress in 20 years, but the outlook for the next couple of years does look MUCH more promising. My hope is R Street can achieve a completely different setting than the rest of the central city, and Sacramento in general. I'd also like to see the entire street give way to people walking with cars playing second fiddle. The section between 16th and 19th be closed off to traffic for public space for the events I hit below. There are a couple good spots to go on R Street, but we really need to fill in the gaps between 10th (Fox and Goose) and the 15th (Empire complex), fix up the 13th and 16th Street stations and clean up the streetscape so people feel comfortable walking down at night, or even during the day for that matter. While there are many more opportunities out there for development, i.e. 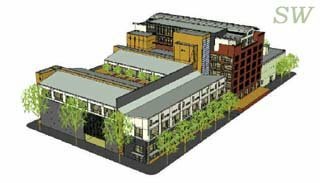 the parking lot across from Fox and Goose, here is a rundown of what we can expect in the next couple of years. 7-8 years in the making, crews are now on site and have begun work on turning the old warehouse into R Streets first major housing venture. This is a newer one that is going through the city planning process. -Mark Freidman has purchased the Crystal Ice Buildings and Nguyen of the La Bou franchise has purchased the Orchard Supply Building. Unfortunately, due to what I am sure if very high contamination, I do not expect any housing to be built on these sites. Strictly retail and dinning. I have very high hopes for that area around the Crystal Ice and Orchard Supply Building. I think that area will make an amazing public space with outdoor eating, street fairs, farmers markets, flea markets, and street performances. Given that Freidman is involved, I expect nothing but the best. The guys from Loftworks are putting some very good urban products out there. -CalPERS and Regis Homes have securred virtually every parcel on R Street between 2rd and 7th Street with plans of buildings hundreds of new homes. The first pahse is the 36 unit SoCap Lofts between 6th and 7th Street on the north side of R Street. The next phase should be SoCap Lofts II , 36 more units on the south side of the 6th / 7th Street block. I have also seen renderings for a 5 story apartment project on R and 5thish' Street that is a year or so away.